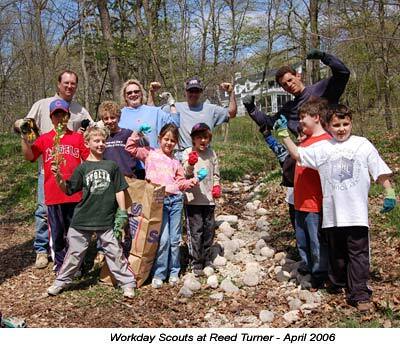 The Indian Creek Watershed Project is Over 15 Years Old! Since 2000 Nearly $4.5 Million in Projects Have Been Awarded in the Indian Creek Watershed. The Indian Creek Watershed Project is comprised of watershed stakeholders dedicated to the preservation, protection, and improvement of the Indian Creek sub-watershed of the Des Plaines River. Our mission is to realize a long-term vision for a healthy watershed and an educated citizenry. Our goal is to educate while building partnerships to improve water quality, reduce flooding, and preserve and restore wetlands, woodlands, and other natural resources for future generations. The Indian Creek Watershed Project Ltd. was formed in July of 2000 for the benefit of the Indian Creek watershed. This organization was formed to oversee an IEPA 319 grant received in April of 2001. The group received nonprofit status in January 2001 and ended non-profit status in 2014 after participating in over 15 grants to improve water quality. The Indian Creek Watershed Project was formed in the summer of 2000 to promote water quality education and improve conditions in the Indian Creek watershed and beyond. 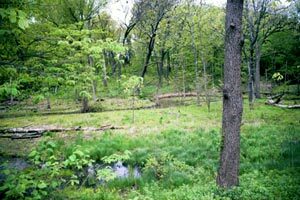 Our effort has been a regional one in the Chicago area within the Indian Creek watershed, a sub-basin of the Des Plaines River in northeastern Illinois. The Indian Creek Watershed Project (ICWP) was founded to help improve water quality and reduce flooding via stakeholder education and regional improvement projects.Our organization is unique in Lake County because it is sub-basin oriented and we have worked across municipal and township boundaries. Our watershed encompasses parts of the villages of Mundelein, Vernon Hills, Hawthorn Woods, Long Grove, Lincolnshire, Lake Zurich, Kildeer, Buffalo Grove, Indian Creek, and drains from portions of the townships of Fremont, Ela, Vernon, and Libertyville. The Indian Creek Watershed Project first began grassroots stakeholder (meaning involving those living or working in the watershed) planning for the Indian Creek subwatershed in the spring of 1999. 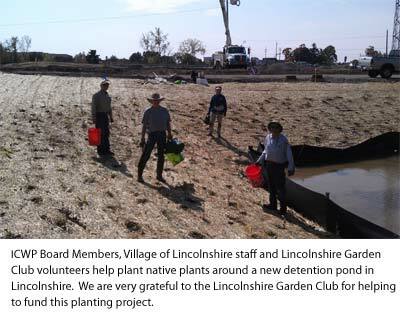 The volunteer planning was undertaken with the guidance of Conservation 2000's WI-IL Upper Des Plaines Ecosystem Partnership, the USDA/IDNR's Resource Planning and moved forward with technical support from watershed planners at the Lake County Stormwater Management Commission (SMC). Public planning meetings were held from 1999 to 2010 to inform stakeholders about water quality and area resources, to promote grassroots planning and support for watershed improvements. Several watershed assessments have been completed because of the strong stakeholder and agency support: lakes assessment, a sub-basin wide stream inventory, Riverwatch data collection, Critical Trends Assessments and a state recognized Watershed Implementation Plan. We have been the catalyst for watershed grants received from the Lake County Stormwater Management's Watershed Management Board (WMB) and the IEPA Clean Water Act 319 grants. By networking with area governmental bodies and agencies, opportunities and needs within the watershed were identified and projects completed. Our efforts have benefitted governmental planning within the sub-basin by collaborating on projects to improve water quality and other conditions in the watershed through public outreach and site implementation. Our all-volunteer force is comprised of individuals with communication skills beyond boundaries, expertise in sharing information, and a dedication to promoting comprehensive watershed-wide stakeholder opportunities. Our hope is that ongoing efforts in Indian Creek will lead to improved conditions for the Des Plaines River and even have a ripple effect downstream. Recognition is building for the effectiveness of subwatershed efforts because they educate local stakeholders and planners while building support over multiple jurisdictions. There are many sub-watershed efforts now in the state of Illinois. They arecollectively improving main stem river and lake conditions because of public driven intervention and education throughout the watershed. The hope is that other watershed efforts will result in improved conditions for majorrivers, like the Upper Des Plaines, the Illinois and the Mississippi Rivers downstream. The Indian Creek Water Project members worked with Lake County Stormwater Management’s Indian Creek Watershed Committee (ICWC) to provide stakeholder input for the Indian Creek planning process led by the Lake County Stormwater Management Commission under an IEPA Section 319 Clean Water Act grant from 2000 to 2006. The plan was ADOPTED in the fall of 2008 and updated in 2013. Having a watershed plan enabled all stakeholders to apply for federal and state grants and complete some effective watershed projects. To preserve, protect, restore and enhance the resources, function and values of the Indian Creek Watershed through stewardship, education and partnerships. Protect, Restore, Enhance, or Maintain Channel Function and Conveyance. 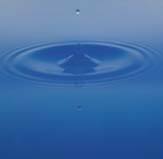 Maintain or Improve Water Quality. Enrich Quality of Life and Develop Cultural Values for a Sustainable Watershed. Develop Environmentally Sustainable Recreation Opportunities. Demonstrate Economic Benefits and Provide Incentives for Sustainable Land Use Practices. Foster Watershed Stewardship and Awareness through Education. Utilize Open Space to Achieve Watershed-Wide Goals. Develop Stewardship Network for Long-Term Management and Monitoring. Create and Enforce Development Regulations that Benefit Watershed-Wide Goals.